It’s always fun to shoot baseball. Especially high school baseball. And with that, I heard a huge collective “Ugh.” I like photographing it because it is a challenging sport to shoot. You have to read the game, read the players, understand basic strategy, and mostly have fun. 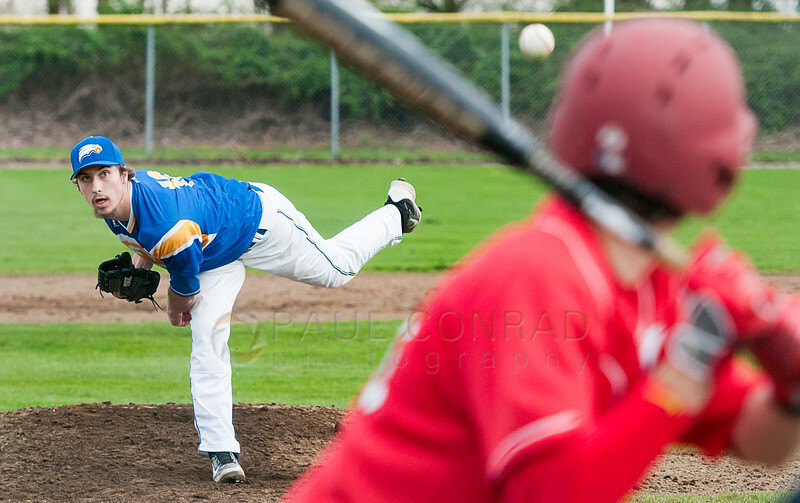 © Paul Conrad/The Bellingham Herald – Bellingham pitcher Brad Johnson tosses to Ferndale. Shooting through chain link fencing can be tedious, but if you position your lens dead center, the distraction is minimal. But the most important part of shooting baseball, or anything for that matter, is to PAY ATTENTION! In baseball, moments are incredibly fleeting. A few times I have chatted with others only to miss great play. So don’t get distracted. Pay attention to the game, only chat between innings and team changes. Keep on your toes. 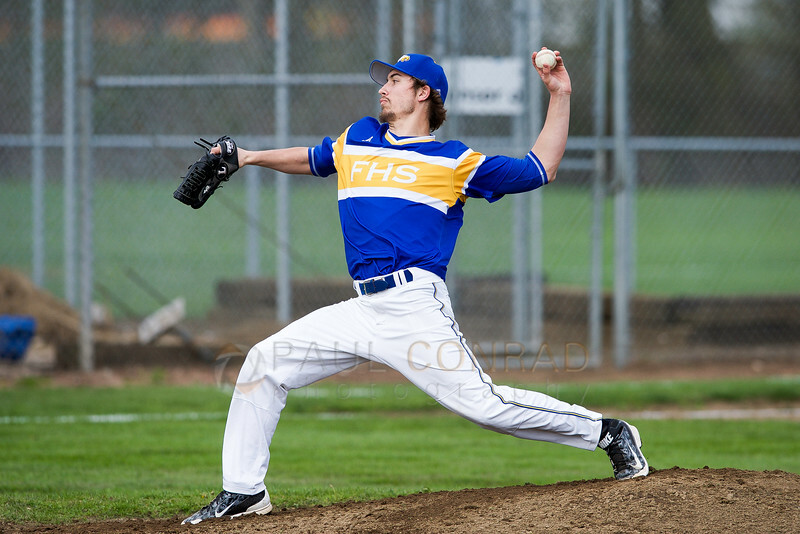 © Paul Conrad/The Bellingham Herald – Ferndale pitcher Kyler Schemstad (18) pitches to Bellingham during the second inning at Ferndale High School. Position yourself so the pitcher’s body is framed by the batter. To photograph the Battery, the pitcher/catcher/batter/umpire combo, you have to be mobile. No sitting in the bleachers, no staying in one spot along the fence, you have to move. In fact, you may have to shoot from the 3rd base line, as well as the 1st baseline. © Paul Conrad/ Pablo Conrad Photography – Meridian Trojan boys against the Brewster Bears at Meridian High School in Bellingham. A hard photo to capture is getting the ball just as it leaves the tips of the pitcher’s fingers. Don’t be afraid to shoot through the fence. If you position your lens properly in the center of the square of the chain link, the distraction is minimal or non-existent. If the squares of holes of the fence are small, you’re just going to have to use the largest aperture possible. Using f/2.8 or f/4 is best to decrease the effect. 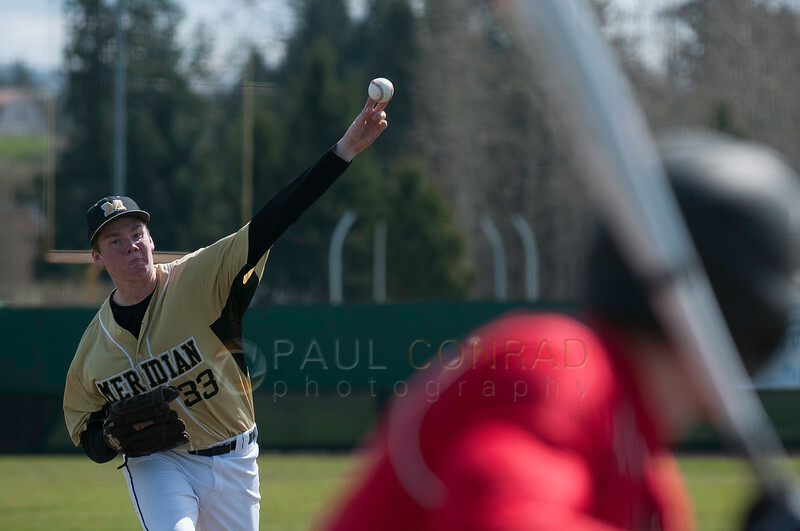 © Paul Conrad/The Bellingham Herald – The Ferndale Golden Eagles host the Bellingham Red Raiders in varsity boys baseball at Ferndale High School. 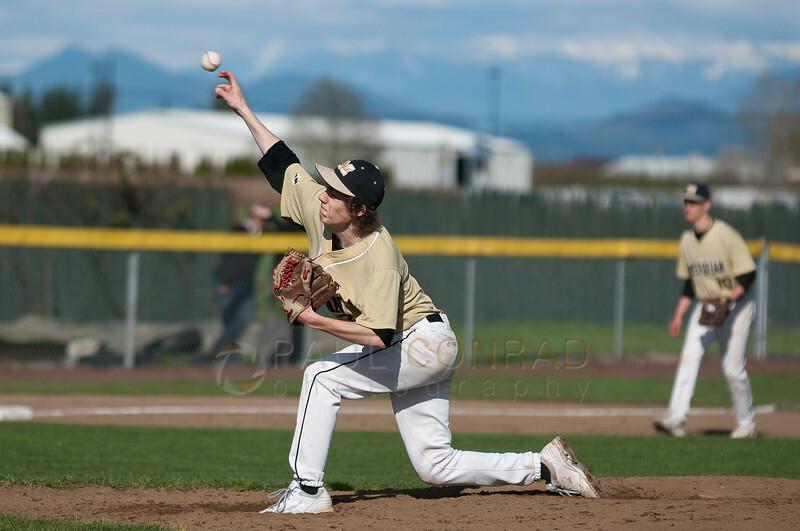 Notice how the face is visible in the left-handed pitcher’s windup? 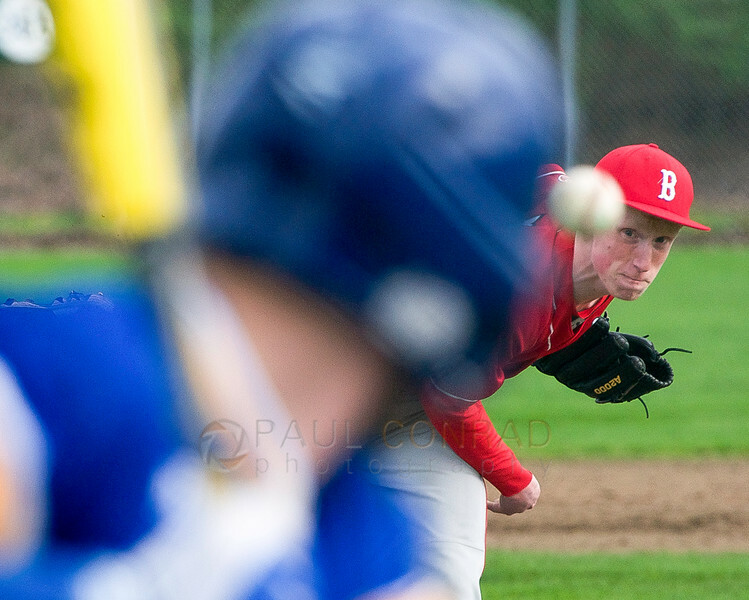 © Paul Conrad/The Bellingham Herald – Bellingham’s Brad Johnson winds-up as he pitches to Ferndale. Shot from the same angle as the photo above, notice how you can’t see the pitcher’s face all that well. © Paul Conrad/ Pablo Conrad Photography – Meridian Trojan boys against the Lynden Lions at Meridian High School. Notice how as the right-handed pitcher releases the ball, his face become more visible. Every battery is different: different pitcher, different batter, how the catcher and umpire sit. Even how the pitcher throws will affect your choice of position. Again, stay fluid and try every angle. Shooting the pitcher from the side you need to remember one simple rule: If they throw right-handed, then you won’t get a good face from their right side. Think about when you throw. Your face is covered by your right arm and shoulder. Now add the power as they throw, their head turns towards their left and is further obscured. Focusing is critical. But you have to prefocus in front of the pitcher. This does take some practice. Don’t rely on your autofocus. In fact, watch the pitcher as you shoot. Focus on his front foot as it lands. This is almost the same plane as where his face will be when he/she releases the ball. Again, see the photos above. Prefocus and use manual or lock the focus. It keeps your lens from “hunting.” Sometimes the lens will try to focus on the battery or the background. By using manual, you focus and won’t lose that focus if the camera picks something up while shooting. If you use autofocus, set your camera so the shutter is not activating the focus. I set mine so the back button activates autofocus. 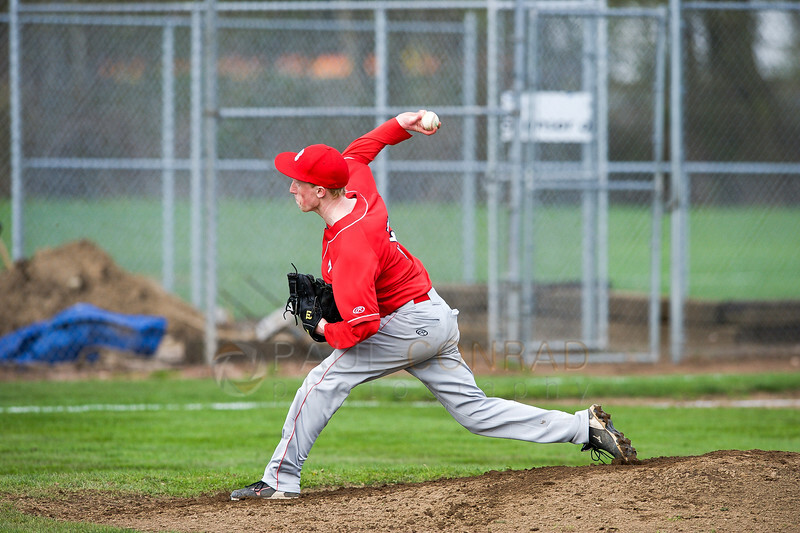 Use shallow depth of field to separate the pitcher from the battery (batter, umpire, catcher) and background. The basic principle of making your main subject the focus of the photo. Use a high shutter of 1/2000th or faster. On cloudy days you’ll have to up the ISO. stops any blur as they do move rather fast. Place your hand at the end of the lens barrel to keep it centered through the gaps in the fence. While behind the battery, use the umpire, catcher and batter as a framing device. Shoot the pitcher from the first baseline and third base line. Pay attention. Don’t get distracted during active play by others around you. Literally, stay focused on the game. Have fun and try new things. You just never know.